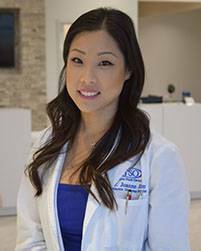 Dr. Joanne Kim grew up in Irvine, California in a Korean-American family and speaks Korean fluently. Dr. Kim graduated from the University of California, Irvine with a Bachelor’s degree in Psychology and Sociology and was recognized in the National Honors Society. She moved to the great state of Texas to pursue her interest in optometry and later received her Doctorate of Optometry from the University of Houston, College of Optometry. She is a licensed Therapeutic Optometrist and is certified as a Glaucoma Specialist. Dr. Kim had clinical training at Good Neighbor Clinic in Houston. Dr. Kim’s interests include the treatment of ocular disease such as dry eye disease, acute illnesses, post op surgical care, vision correction surgery, pediatrics, geriatrics, specialty contact lenses, and diabetic retinopathy. She is passionate about volunteer work and giving back to the community and has participated in several community service programs. Some of her favorite volunteer experiences include a Mission trip to Mexico and at Houston’s Outreach Medicine Education and Social Services (H.O.M.E.S) Clinic, both where she was able to provide eye care to a population of people who otherwise would not be able to receive proper eye care. She is also an active participant in the city of Houston’s See to Succeed program providing eye care to children in need of eye exams and glasses. Dr. Kim is an active member of the Texas Optometric Association and American Optometric Association. When Dr. Kim is not working at Texas State Optical, she enjoys spending time with her friends, boyfriend and their dogs; they have a German Pinscher, Axis, who is 5 years old and a very hyper rescue, Bella, who is 3 years old. Dr. Kim tries to stay active by going to the gym and enjoys doing bikram yoga. She loves being outdoors and enjoys hiking, going to the beach and snowboarding. She loves to travel when she gets the chance to, especially to California to visit her family, and would like to have visited every continent one day.